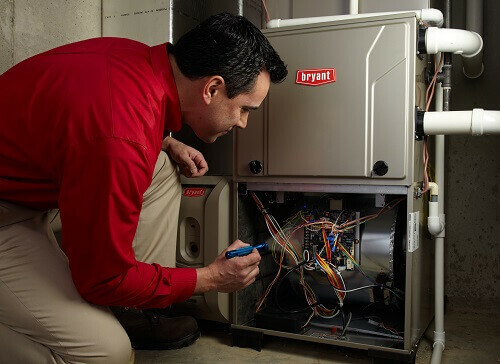 You might be surprised to learn that the best way to ensure your heating system runs great year after year is by getting heating maintenance. Annual maintenance can help keep your system running effectively and efficiently, and can add years to its life. And, getting the heating maintenance you need for your home is as easy as calling Boelcke Heating and Air Conditioning. At Boelcke, our skilled technicians can help you get the heating maintenance you need. They’ll perform a tune-up that ensures your system is cleaned and lubricated, so it runs smoothly. And, they’ll take care of any minor concerns before they become larger – and more expensive – repairs. By getting the heating maintenance you need for your system, it can run more efficiently – helping you save on energy costs. Count on Boelcke for heating maintenance and more for your home. When you need heating maintenance from a qualified heating specialist for your home, you can trust Boelcke Heating and Air Conditioning. We can help meet all your home heating needs, large or small. Simply give us a call at (269) 429-9261, and we will be more than happy to assist you.